Today isn’t about selling tickets to your stand-up comedy show or laughing all the way to the bank. Instead, today’s holiday celebrates the way laughter can enrich our lives in so many ways. Laughing with friends is one of the best ways to relax, and the health benefits of laughter and having a positive outlook are well-known. Laughter can also help us get through those less-than-perfect situations too—as today’s book shows! Copyright Andrea Tsurumi, 2017, courtesy of andreatsurumi.com. “OOF! OH NO!, Lola cried. I’ve ruined everything!” It does look pretty bad now that the white chair is dripping with juice. Lola knows just how to fix this. She’ll run away to the library and hide. “They have books and bathrooms. And I’ll stay there till I’m a grownup,” she says. She’s running pell-mell for the library when she hears, “OH NO!” She runs over to the playground to see what the matter is and finds that her friend has broken the chains on her swing. “What…do…I…do? !” she asks. Lola knows…. They’re both tearing off for the library when they see Sheep in the midst of a “MAJOR MESS!” Seems he snipped the hose while trimming the bushes, and now the hose is dancing all over the place and water is squirting everywhere. “I…AM…THE…WORST!” Sheep cries. Lola and Bear know how he feels. They can’t get to the library fast enough, so they don’t see Aardvark wheeling her grocery cart down the sidewalk. “OOF! ACK! SPLAT!” Sheep goes flying and dives right into Puffer Fish’s freshly baked cake. Everyone stops to listen and hear how they can make it right. So Lion apologizes to Rabbit, the Rhinos upright Turtle’s car, Lola helps Walrus squeeze out of the tire around his middle, and all over town, friends and strangers help each other clean up the messes. Lola grabs cleaning supplies and races home to find her dad has had an accident of his own. But a little picking up and a little pick-me-up sets the world right again. For kids—and adults—who tend to take an apocalyptic view of mistakes, Andrea Tsurumi’s hilarious cartoon-inspired compendium of “catastrophes” is the perfect antidote. Her sparse text of shocked cries delivered in speech bubbles and all-caps typeface are laugh-out-loud funny and lead readers to linger over the pages to catch one mishap after the next. Tsurumi’s bright illustrations offer the best of slap-stick comedy brought to the page and are a riot of slips, spills, surprised faces, and silly antics. An anteater’s long tongue spells out “Yikes,” a bull leaves a china shop clutching broken shards of dishware, a narwhal nanny inadvertently pops her young charge’s balloon, and a bear thoughtlessly serves a soft-boiled egg to a chicken. Kids will have a blast finding their favorite mishap, spying the accidents waiting to happen, and following the domino-like sequences. They’ll also see that everyone makes mistakes and that, when taken with a pinch of humor, they can be easily remedied. Accident! would make a terrific gift and an often-asked-for addition to home, classroom, school, and public libraries. You’ll find an Accident! Activity Guide to download for fun and educational story times on the Houghton Mifflin Harcourt website. Discover more about Andrea Tsurumi, her books, and her art as well as Accident! activity sheets on her website. People love to laugh, giggle, chuckle—or however you like to say it! Find all twenty-five synonyms for laugh or funny in this printable Made You Laugh! 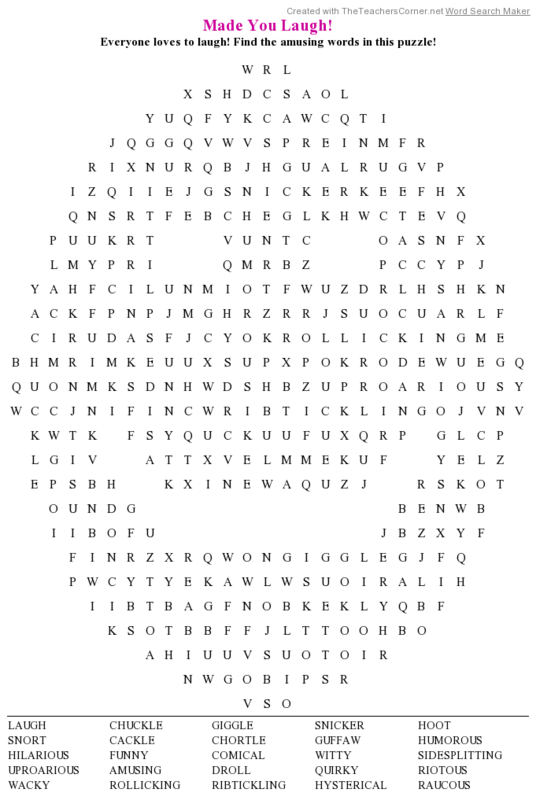 Word Search Puzzle!